I get it– spring cleaning because you can set the wash tub outside, and beat the rugs when it’s warm. But my washtub stays indoors since, despite my pioneer-woman conceits I actually don’t use a scrub board to clean; nor do I beat the rugs. I vacuum them. I don’t want to be stuck inside cleaning when the weather is finally nice and I can get out of the cave for a few hours. Enter the January Cure. This is one of those internet things of which you’re vaguely aware for years. And then a friend says “I’m doing this!” and you think, okay, why not. It’s great “Dark Days” therapy. Last year my friend petered out after a couple of weeks, but I stuck it out and went the whole month. I confess some of the tasks struck me as silly (buy some mass-produced art), or inconsistent with the eco-friendly mandate (buy some cut flowers in the middle of January– they’re only the most ecologically disastrous industry on the planet!). But for the most part it laid a really useful and effective structure for cleaning. Last year I had an entire 10-room house to clean, which was a little more than the “Apartment Therapy” home site was geared towards. This year, I’ve contracted onto my first floor, so I should be able to keep up a little more. I’m going to add my disaster of a basement to the mix (in fact I’m headed there right after writing this). I’ll be going back to my regular Tuesday posting day for reporting. (It seemed ridiculous to post about cleaning on New Year’s Eve- I don’t know about you, but on New Year’s Eve my aim is making messes, not cleaning them up!) I hope you’ll join me in signing up through the Apartment Therapy site, and that you’ll chime in on the comments here about your successes, misses, and surprises. The entire East line of our property (300′) is full of cedar (Juniper) trees. They are wonderful because they help keep the morning sun off our house and that helps to keep things cooler for a while. They offer shade for some of the herb and flower gardens from the morning sun. They provide habitat for the variety of birds that live in our area. They also provide shade for the clothes line, because the hot Texas sun will fade our clothes rather quickly otherwise. Around here, you will hear a lot of people say that the cedar (Juniper) are invasive. You will also hear them say the steal water for other trees and plants. Well, an invasive (to me) is an opportunist. It takes advantage of areas and will continue to grow and produce seedlings if the conditions are right. Back in the day when buffalo roamed our area, there were not a lot of cedar (Juniper) trees. The buffalo hoof traffic kept the cedar trees under control. Since the buffalo don’t roam here anymore the cedar trees have taken advantage of the situation and now grow everywhere. I am not sure if the cedar trees steal water from other plants, I do know that when it rains an inch, that all the leaves living on the tree soak up that water before it hits the ground. After that inch of rain, it is completely dry underneath the cedar trees. So, if that is “stealing,” then I guess they do. As the trees get taller and older, the bottom branches die off. Around our house, we have worked at trimming them off as they do that. The last few years we have noticed that more and more of the cedar are dieing and we find ourselves trying to come up with a plan to plant other trees amongst them to start growing and replace the cedars as they die. 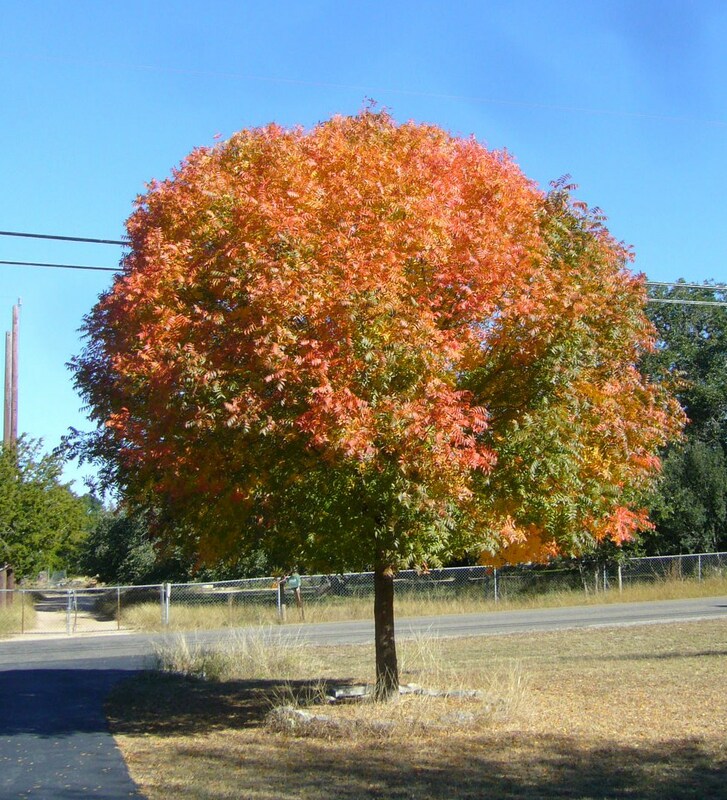 You’ve probably heard the question, ” when is the best time to plant a tree?”…… answer: 10 years ago. Nothing grows real fast here, so had we been on top of this 5 years ago we would be that much more ahead of this game now. Well, we are not, so the best time to plant a tree for us is NOW. We have four Chinese Pistache (Pistacia chinensis) in our yard. They are very established and are wonderful. One of them produced a lot of babies last year so I dug up several and potted them up to get them growing and last fall we planted four of them in the ground and they are doing really well. This spring I was able to dig up more seedlings and we will get them planted this fall. We also have a Vitex (also known as Chaste tree & VERY deer resistant) that is growing in the clump of cedar in the front yard. It does not get enough sun so it is rather leggy and scraggly, but we have taken out three cedars that were around it and it is starting to look a lot healthier now. Last Spring I found two babies under it and potted those up to get established. Last fall we planted those up near the front of the property line so that as we take out more cedar they will be growing up and provide us with some replacement trees and privacy. This is an ongoing process. I am not able to head out with the chainsaw and trim cedar limbs or take down tress right now, so we are doing it as my husband has time. Normally, I would load the truck and take all the cuttings to the recycle place, but I just can’t do that yet either. Several weeks ago my husband went on a trimming spree and we had 4 truck loads of cuttings that he took to recycle. On one of his trips he brought back a load of mulch. I had a plan to start planting more in the front section of our lot near the street and had picked up another Vitex and several ornamental grasses to go with a few agave babies from our neighbor. My husband dug holes and I helped him plant everything. 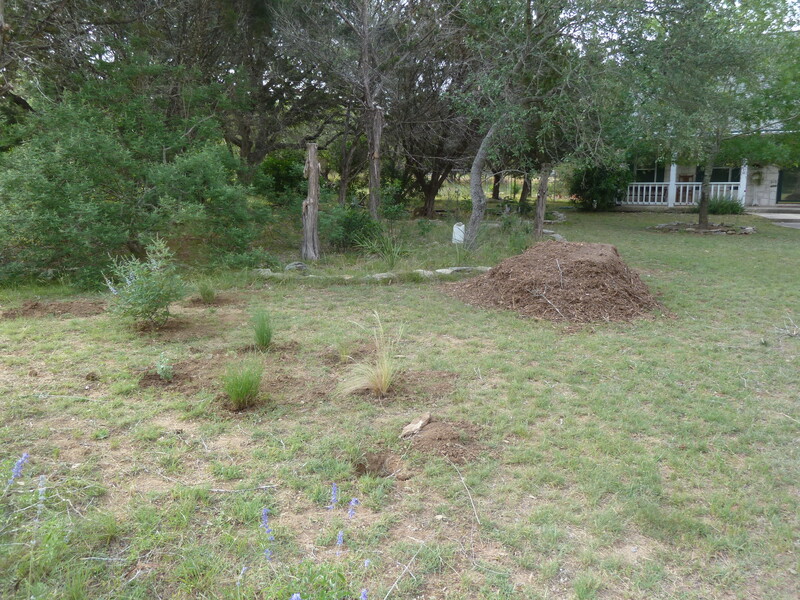 Then I put out the paper feed sacks and we (he) covered that all with mulch. It is doing well. You can see the area of cedar in our front yard and a few more dead trees that need to come out. You can also see the Vitex blooming (light pink) in the background. 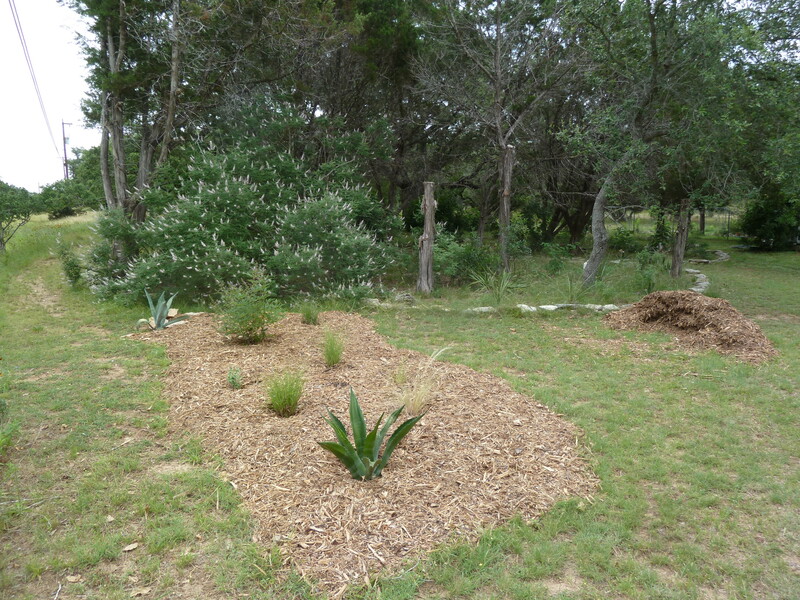 I have plans to create some sort of berm using some of the tree trimming and cover it with dirt and plant on and around it, but that is really going to have to wait until I am completely recovered so I can take that on myself. My husband is really starting to see the urgency of getting other things planted as he starts to see how many of our cedar are dieing. I am grateful that he has had the time to help with the trimming and planting to move things along. It is an ongoing project, but it is nice to see some progress and some things taking shape. Are you working on any yard projects? I am just trying to accept my new pace for now and have termed this year “The Year on Hold.” My mind is still moving at its normal speed, but my physical body is moving at a fraction of normal. I would say 1/8th speed of less. Dang that is slow. 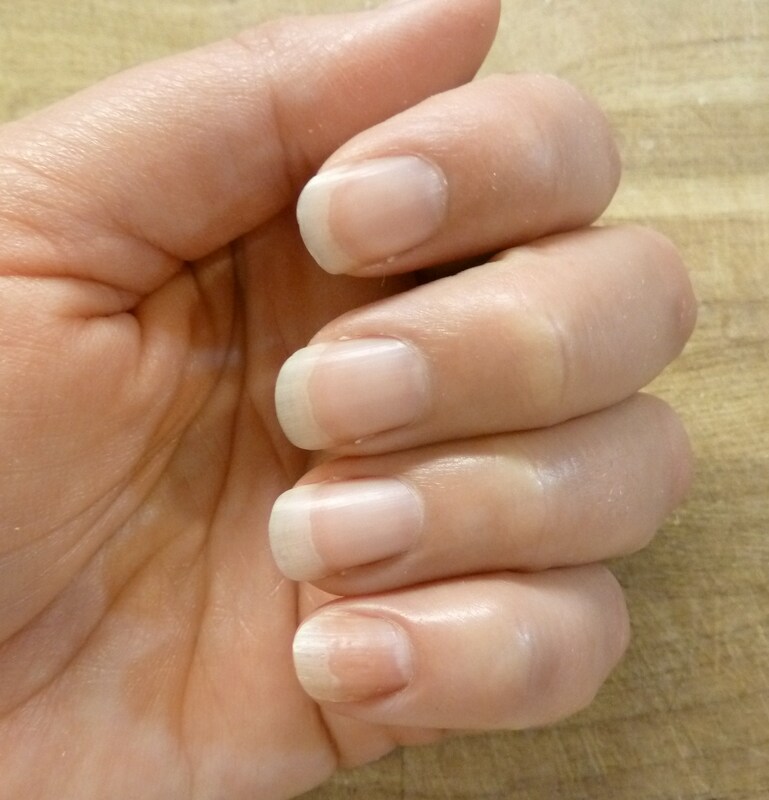 My hands and nails haven’t been this clean in a long time and my nails are longer than they have been in years and year. 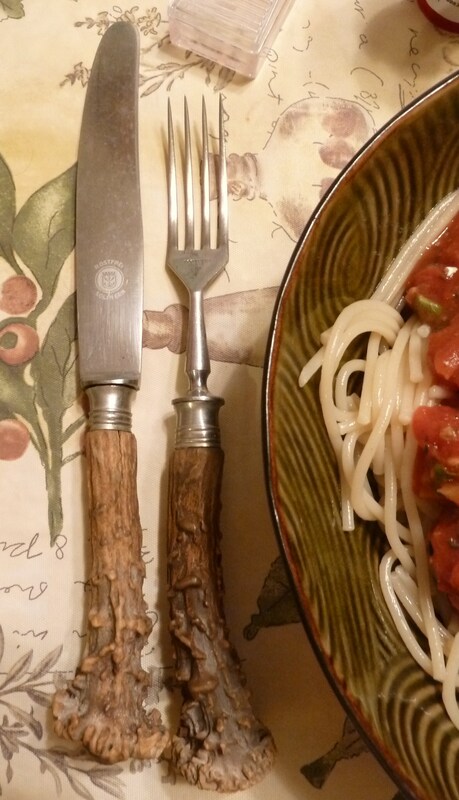 I cleaned out some stuff in the silverware drawer and found a set of 2 forks and 2 knives that had been my Gramp’s. I set them out for a meal one night. Mom and I had fun looking at them and talking about them. She thought they were mostly likely from Gramp’s second wife’s brother who had been in Germany and brought them back. The antlers are so much more knobby than the deer antlers here in the US. and the detail is beautiful. They were fun to use and enjoy. The 14 year old neighbor girl came over on day and I taught her how to make granola bars. I sat on a stool in the kitchen and guided her through the recipe. It was fun for both of us. As we waited for them to cook and cool, we played a game. I let her pick the game and she chose Battleship. I bought the game at a garage sale a few years ago and this was the first time I had played it in decades. The game was missing a few of the boats, but we made it work. On the first game we each hit a ship on our second guess. Imagine that. The second game it took us forever for either of us to hit a ship. It was pretty funny. I managed to take another trip to the emergency room last Sunday. I only stayed 4 hours this time and I am determined to not go back (unless I have to of course.) The blood clot has broken up (that’s a really good thing for me) and I should be on the road to recovery and smooth sailing at this point. The big thing right now is to get my INR (International Ratio) level stable in the therapeutic range. I go to the lab for a blood test once a week and then we adjust the amount of coumadin that I take to keep the INR in a stable therapeutic range. The range we are shooting for is between 2-3. In the mean time I am digging through and cleaning out drawers a little at a time. I am going through piles of papers and organizing what I can a little at a time. I also hope to have time to work on blog posts and read other blogs and comment more consistently. My mom picked all the cabbages for me before she headed home and I hope to get a crock of sauerkraut fermenting (with help.) I imagine many of you in the northern hemisphere are getting antsy for spring to arrive. In my area we have already hit 90F and most people have their spring gardens planted. “The Year on Hold” will still be frustrating for me, but I will make the most of what I can. 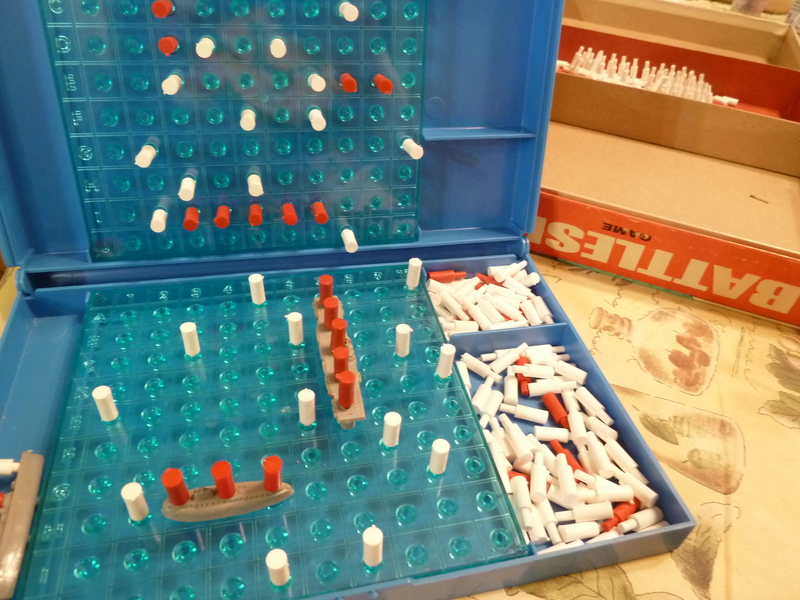 When was the last time you played Battleship? This is the second in our repostings of Jen’s wonderful posts on monthly planning. Originally posted in 2011, here’s what to do in the traditional dead of winter. February can be one of the last chances to get indoor projects completed before the spring thaw arrives. Gardeners are getting excited and it won’t be long before the first of this year’s farm babies are here! Spring is really just around the corner, so start wrapping things up inside and get ready to head back outdoors. Check basement or crawl space for leakage during thaws. Check bathroom caulking for re-sealing needs. While you’re in there, check your pipes for leaks. Freshen your kitchen sinks by pouring a mixture of 3 cups hot water and 1/4 cup vinegar (or the juice of one lemon) down each drain. Keep an eye out for cracks in your drywall caused by settling during thaws and freezes. There are expandable putties and spackles available for problem areas. While you’re at it, you may want to mark outdoor masonry to be repaired. Plan to complete this project after the last hard freeze and once your biggest worries of the house settling are past. If you don’t have a cold frame or greenhouse, set up an area to start seeds for your garden. Few seeds need light to germinate (be sure to read the directions) so you may be able to get by without any lights other than a window for the first few weeks. (Check out chiotsrun seedstarting 101 guide). Research and prepare for any animal purchases for the year. Keep a tray of water and spray bottle near indoor plants to adjust humidity levels, especially if you have central air. Running the heater can dry them out quickly and cover leaves with dust. Keep fresh water available and free of ice for birds and wildlife. It’s National Bird Feeding Month. Keep feeding those birdies! Seed, dried berries, and suet are great meals for our feathered pals. If you live in a climate with mild winters, this month may be a good time to dig new beds. You may also want to repair or build new composting bins to be prepared for this year’s cleanup. Southerners could get away with planting bare root trees on warm days. Keep driveways and walks free of snow and ice. Have shovels, plows, and salt/brine accessible and stocked. Watch gutters and roofs for ice dams. If you didn’t get to it during fall, now would be a great time to oil and sharpen garden tools. Be prepared for early birthing. Have any equipment you’ll need ready and accessible. Nights are still very cold in most parts of the country. Keep your critters warm with fresh hay, heat lamps, or blankets, but be sure to avoid fire hazards. If you’ve been leaving a light on for your chickens you can begin weaning them off of it. The sun is setting noticeably later and your gals should begin laying more regularly soon. You can also find Jennifer in archive at Unearthing This Life where she used to blog (or as she called it “blarg”) a bit about good food, home schooling, raising chickens, and being a suburban Yankee transplant in a rural southern town. She’s not writing right now, but her wonderful posts are well worth scrolling through. I’ll be reposting Jen’s wonderful series on monthly chores and tasks throughout the year. Here’s January, originally posted on January 7, 2011 by Unearthing This Life. 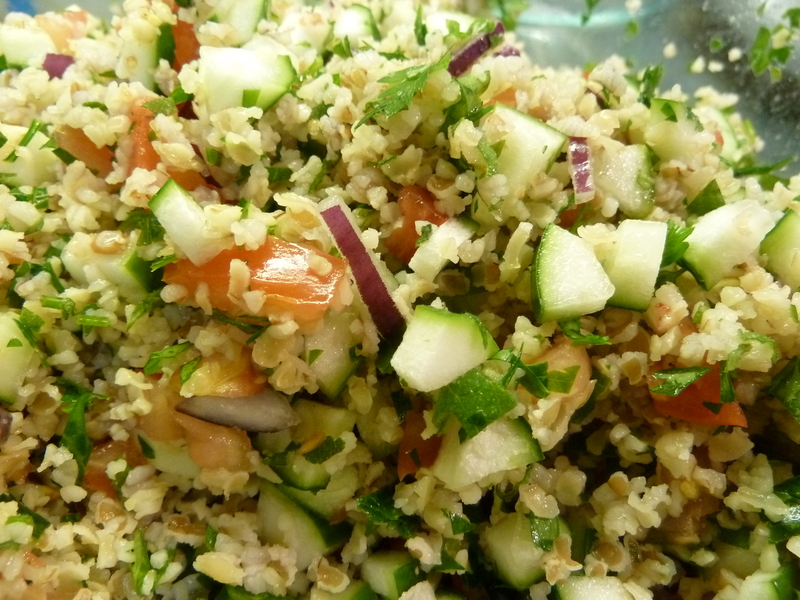 So many of us are working our way toward a more self-sufficient lifestyle. With that in mind we here at NDiN wanted to share some general guidelines of what to plan for on a monthly basis. Whether you’re a gardener, a beekeeper, a forager, or you keep animals, hopefully our monthly guides will help you plan ahead for the month. Depending on your exact climate you may find you need to adjust your schedule depending on your region. Now that Winter is officially here most of us will be spending a lot more time indoors. For those in the more Southern regions, outdoor work is manageable on warmer days. It’s a good time to focus on the indoors, keeping warm, and getting a jump on this year’s activities. Take down and store holiday ornaments and decorations. Update your address book from holiday cards and gift envelopes if you’ve saved them. Clean out your files in preparation for tax time. Rid yourself of out-of-date warranty cards (update if necessary) and manuals. Schedule service appointments for extended warranties. Clean out dryer vents with a wire hanger and vacuum cleaner. Wash mesh filters with soap and a scrub brush to allow for better air flow. When finding new homes for holiday gifts, clean out unused items and donate those in great shape to your favorite charity. It’s also a great time to photograph your belongings, room by room, for insurance purposes. Start planning your spring garden. Look at gardening catalogs, websites, and blogs (like us!) to get ideas for what to do this year and when. 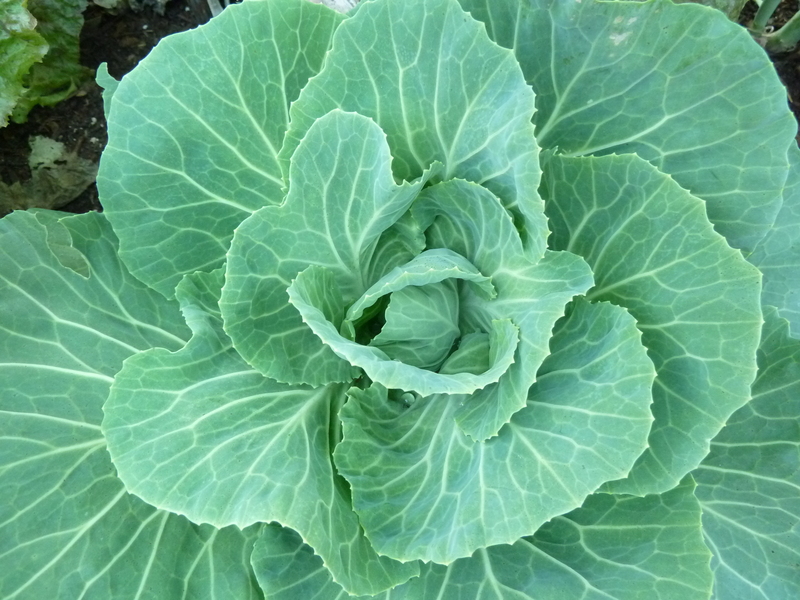 Purchase seeds by March to guarantee delivery and stock. If you’ve already begun to put out birdseed continue to do so. They’re now relying on you as a food source. Early birthing will begin late next month for some of you. Make any preparations necessary to help mammas and babies along. Keep barns and other animal shelters clean to help prevent illness and discourage wild critters from nesting. Change hay often, keep tools cleaned up, and be sure to keep water free of ice. Put a light out for an extra two hours in the evening for your chickens. It will help keep their coop warm on colder evenings and promote more egg laying. No New Year’s resolutions around here. I really liked Xan’s post the other day and I enjoyed reading Annie Rie’s post Six at Sixty. I have accomplished many things over the past year and will continue to make my lists and continue to check items off those endless lists. I much prefer my to-do lists to resolutions. Am I going to start a New Year’s list? Heck no, my other lists are still way too long! There are times I feel like I have been sitting around and I wonder if I have accomplished anything, but when I start to think about the things I have done and the things I have accomplished I lighten up a bit. Not all things are huge and noticeable. Tomorrow is a new day. I look forward to many new days in this New Year. I hope you do to.